The major destinations that mark the three points of Sri Lanka's Cultural Triangle are Anuradhapura, Polonnaruwa and Dambulla, although some people put the southernmost point of the triangle at the beautiful city of Kandy. While Kandy is a must for travellers in the region, it is located in the lush highlands of Sri Lanka and is therefore different in character to the ancient wonders of the triangle, which are located in the dry interior plains where the flat landscape is interrupted by dramatic rocky outcrops. This region was traditionally referred to as Rajarata, 'The King's Land', and boasts a wealth of fascinating historical sites from the Golden Age of Sri Lankan civilisation, many of which are now UNESCO-listed. 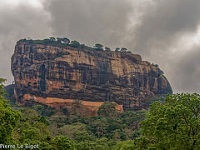 Apart from Anuradhapura, Polonnaruwa and Dambulla, travellers are awed by the rock fortress of Sigiriya, the ancient monastery of Ritigale, and Mihintale, the birthplace of Buddhism in Sri Lanka. 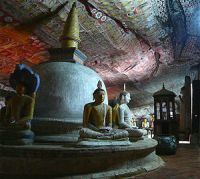 Lesser known attractions include the great Buddha statues at Sasseruwa and Aukana, the mysterious old cities of Yapahuwa and Panduwas Nuwara, and the temples of Aluvihara and Ridi Vihara. Travel in the Cultural Triangle is usually safe and trouble-free, especially in recent years, but there have been some terrorist attacks in the region and it is a good idea to check up-to-date travel advice from official sources about the safety situation before booking your trip.